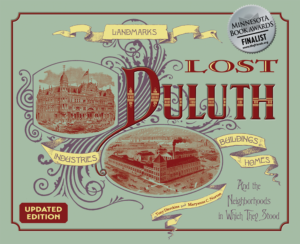 Duluth’s Wieland brothers built a business block at 24 East Superior Street in 1882 to house their furniture store. While the building remains, Wieland Brothers Furniture was bought out by the George A. French Company (originally Rainey & French), which in 1892 changed its name to French & Bassett. The firm specialized in furniture for homes, businesses, and schools. In 1905 French & Bassett commissioned Minneapolis architects Long & Kees—designers of Minneapolis’s City Hall, to design a new furniture store. The three-story Romanesque Revival structure, built of brick and stone, featured prominent square towers on each corner, three entrances on First Street, and an elaborate curved main entrance on Third Avenue. A 1907 addition added a fourth floor with a Mansard roof and other ornamentation to the building’s exterior. By 1936 the firm was operating as French, Bassett & Scott, and in 1947 it moved into a new building at 2–6 East Superior Street along with A. F. Butchart & Sons, a dinnerware company, and Martha Strassburger’s women’s apparel shop. Maurice A. Rudolph opened a furniture store in the former French & Bassett location, but just a year later the building was destroyed by an enormous fire. Many surrounding buildings were damaged, and the collapsing building buried several cars.